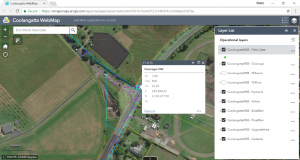 EMAP Consulting has been providing Shoalhaven Water with GIS Services for 4 years. Shoalhaven Water plans to migrate from the existing ArcFM to ESRI’s Utility Network. 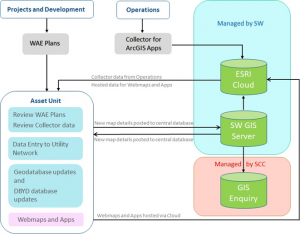 This project has a number of other objectives, including automation of a link between the GIS and the Asset Management System, as well as more streamlined workflows for capture and editing of asset data in GIS. EMAP Consulting prepared a GIS Strategy to outline a process for this to happen, which takes into consideration organisation needs such as server and systems administration, data migration requirements, and addressing the needs of the various users of GIS within the organisation. Department of Planning and Environment required a complete review of the “Extant Native Vegetation” (ENV) Base Case layer for Sydney’s Growth Centres. 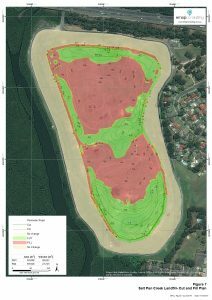 The original data was prepared in 2006 with course aerial imagery and vegetation mapping. 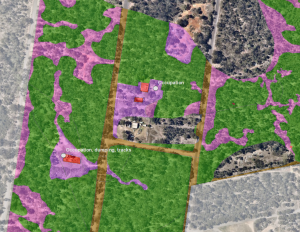 Since that time vegetation mapping has been revised, and many areas have been cleared and/or modified to accommodate the rate of development in the Growth Centres. The revised base case map prepared by EMAP Consulting was prepared by compiling and analysing multiple complex spatial datasets. Consultation was then carried out with the six local councils within the Growth Centres via workshops and a webmap prepared and shared with the project team for collaborative purposes. Further validation of current vegetation status against recent high resolution Nearmap imagery was conducted to ensure data accuracy. EMAP Consulting was engaged by Earth2Water to prepare a 3d design for rehabilitation of a landfill site at Salt Pan Creek near Milperra. 3. A cut and fill plan was prepared by performing a spatial analysis of the variations between the existing surface and design surface across the study area. EMAP Consulting were engaged by Shoalhaven Water to prepare an Addendum REF for proposed modifications to the REMS 1B Project, which included onsite asbestos disposal and encapsulation at the Bomaderry Wastewater Treatment Plant Site. 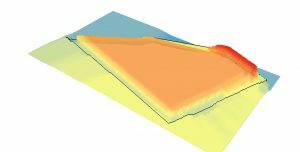 As part of the REF, EMAP Consulting mapped and modelled the encapsulation site in 3D. This included the preparation of a series of digital elevation models (DEM) for existing and proposed surfaces. The DEMs were then used to make volumetric calculations on the required amount of material to be disposed and selection of the site based on preferred conditions. – Preparation of a Review of Environmental Factors (REF) document for public exhibition.